Holy Taco has been on the list of places that I wanted to try for several months, but we never seemed to be in that neighborhood (East Atlanta Village) AND to be in the mood for tacos at the same time. We arrived around 2:00 on a Sunday and, aside from the party of eight off to the left, had the place pretty much to ourselves. First order of business, appetizers. chips and salsa? or chips and guacamole? We decided to start with the guac and a couple of Diet Cokes and the waitress got the order started. A few minutes later the luscious green bowl above arrived with a bowl of hot, fresh-made chips. 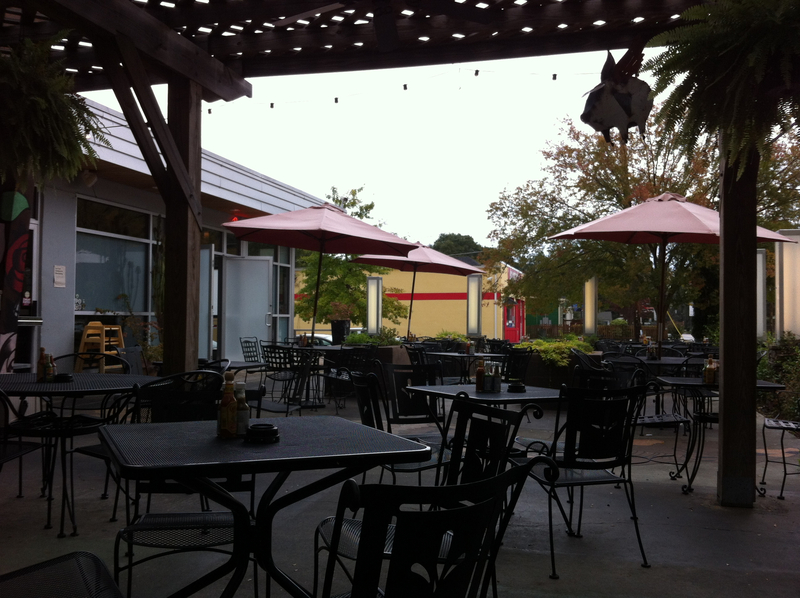 The guacamole was fresh-made and tasty, not quite enough lime and too much onion for me, but we ate most of it. The chips were excellent. They actually appeared to be doubled (like a fried thin folded tortilla) and portended good things to come. 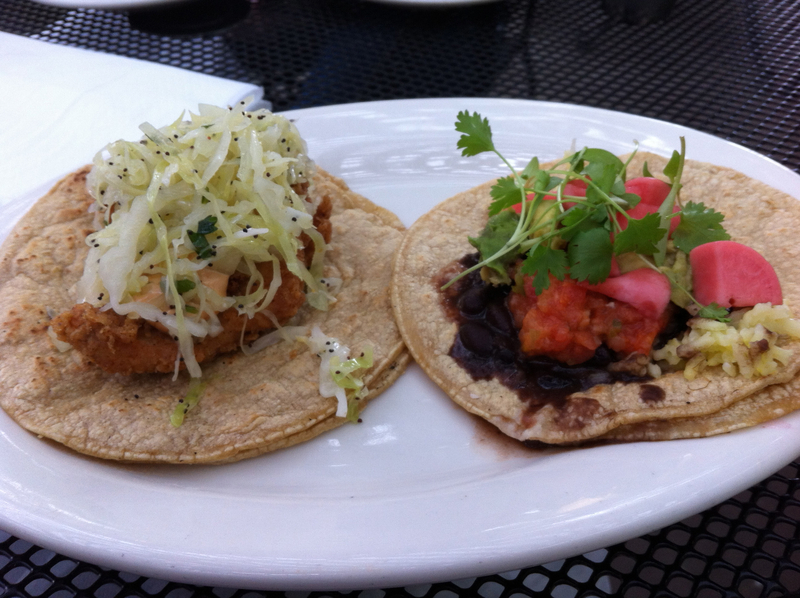 Jo chose (on the left) a fried sword fish taco with mexican slaw and chipotle aioli and (on the right) a vegan taco with black beans, rice, radish, avocado, and ecuadorian salsa, both on corn tortillas. She enjoyed the fish taco more than the vegan one, however, had I volunteered the information that I wasn’t going to be eating my Mexican slaw, she likely would have thrown that on the black beans and eaten more of that one. As for the Ecuadorian salsa, we tried to get an answer as to exactly what that was and how it differed from salsa with which we might be familiar to no avail. When we ordered some on the side, it was thin, chunky, slightly spicy and heavy on the cilantro. 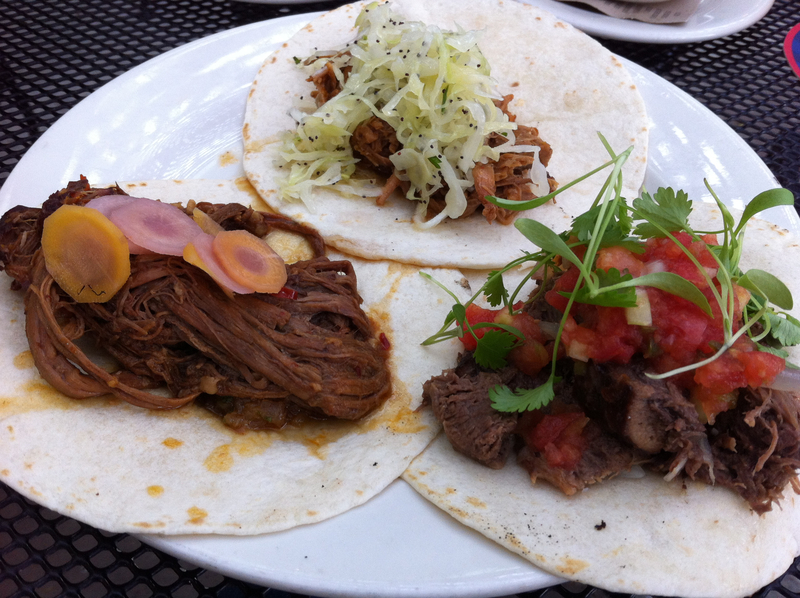 Being the adventurous sort, I chose (starting bottom left and going clock-wise): slow cooked grass-fed beef brisket with vidalia onion relish and carrots escabeche; 12 hour roasted pork shoulder with mexican slaw; and roasted beef tongue with tomato cucumber salsa and Ashland Farms cilantro, all on flour tortillas. Yep, beef tongue. Surprisingly, the tongue (I think this is called tlayuda in a true taqueria) was tender, not chewy. But the texture reminded me of liver and I couldn’t finish that one. The brisket taco was, by far, the best of the three. We also shared a side of stewed black beans with cojita cheese, that I imagine would have been even better poured over a platter of rice. They were spicy and the cheese was slightly sweet. A good combination. I don’t know that I would consider Holy Taco “destination dining” (meaning I wouldn’t drive into town just to eat there), but I’d stop in again if we were in the neighborhood.